Minister of Tourism, Hon. Edmund Bartlett (right) shares a light moment with Minister of Energy, Science and Technology, Hon. Fayval Williams and CEO of GB Energy Texaco Jamaica, Mr. Mauricio Pulido ahead of today’s press launch of Texaco Jamaica’s centennial celebrations. The event was held at the Jamaica Pegasus Hotel, New Kingston. 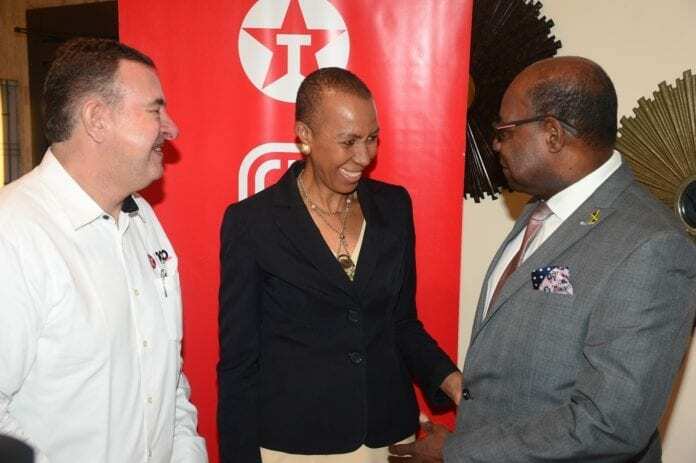 Texaco Jamaica has pledged its full backing of the Global Tourism Resilience and Crisis Management Centre (GTRCM) that was launched in January in Montego Bay. The announcement was made today (February 19) by CEO of GB Energy Texaco Jamaica, Mr. Mauricio Pulido at the press launch for Texaco Jamaica’s centennial celebrations at the Jamaica Pegasus Hotel, New Kingston. 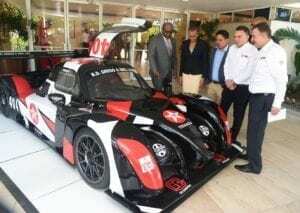 Texaco Brand Ambassador Kyle Gregg (2nd right) proudly shows his Radical RXC to (l-r) Minister of Tourism, Hon. Edmund Bartlett; Minister of Energy, Science and Technology, Hon. Fayval Williams; President of the Jamaica Gasoline Retailers Association, Gregory Chung; Communications Strategist, Ministry of Tourism, Delano Seiveright and CEO of GB Energy Texaco Jamaica, Mr. Mauricio Pulido. The occasion was today’s press launch of Texaco Jamaica’s centennial celebrations at the Jamaica Pegasus Hotel, New Kingston. “The Caribbean is the most tourism dependent region in the world and we have some 10% of the total operating costs of tourism being for energy. When we examine it carefully, next to labour costs, energy costs are the highest element in the tourism cost structure. You see then how critical your sector is to the industry,” said the Tourism Minister. He noted that the global hospitality industry is going through a huge transformation, both in terms of green tourism and digital revolution in response to changing consumer demands. “To meet these demands we have to change the way we operate and change the way in which we structure our arrangements in the industry. One of the things we have to look at is how we enable sustainability as a standard to which we must all aspire but also to go beyond sustainability to resilience, which is the value added which will ensure the continued thriving of the industry,” said Minister Bartlett. He noted Texaco’s involvement in tourism through the Centre as well as Mr. Pulido’ involvement in the Ministry’s Tourism Linkages Council and its Knowledge Network. Meanwhile, the new Minister of Energy, Science and Technology, Hon. Fayval Williams, noted the tremendous strides Texaco Jamaica has made in the petroleum industry over the years. Under Mr. Pulido’s leadership the company has moved from number three to number one in gasoline retail, grown from 52 service stations to 67, and moved from two percent to 46% market share. “As Minister with responsibility for Energy, I want to assure you of the Government’s firm commitment to the industry, and our continued support in the areas of policy and the maintenance of industrial harmony within the sector,” said Minister Williams. “We are committed to ensuring consumers receive quality petroleum and petroleum products to meet their energy needs. And the Ministry is committed to creating the legislative framework that will ensure not only the quality but safety in accordance with international best practices for the benefit of the motoring public,” noted the Energy Minister. Texaco Jamaica is Jamaica’s longest serving gasoline retail marketing company, having been established in 1919. BANGKOK, Thailand - Central Hospitality International (CHi) is pleased to announce the appointment of Tom Thrussell as the Vice President of Brand, Marketing and Digital.